Today you will travel from Urumqi to Turpan (approximately 2 hours). The Turpan Depression is second only to the Dead Sea in Jordan as the lowest point on earth, and it gets quite hot here. It’s a small city by Chinese standards, but the surrounding area is full of interesting places such as the Jiaohe ruins, remnants of a once great city on the Silk Road. Learn about the ancient Karez irrigation system today at the Turpan Karez Museum. In order to get enough water in the area, long ago the local people dug lengthy underground tunnels that brought the flowing water from the mountains in the north. These tunnels have vertical access shafts that were spaced at intervals that allowed people to bring up water in buckets or to access the tunnel for repairs. You will also stop at Emin Minaret, which at 44 metres is the tallest in China. It was built in 1777 to honour a local general, Emin Khoja. The geometric patterns that cover the outer walls are beautiful, and reflect both Islamic and Chinese design. After a rewarding day of sightseeing, return to Turpan for the night. Perhaps visit the night market tonight to browse and sample some of the local food on offer. This morning visit the ruisns of the ancient town of Jiaohe. 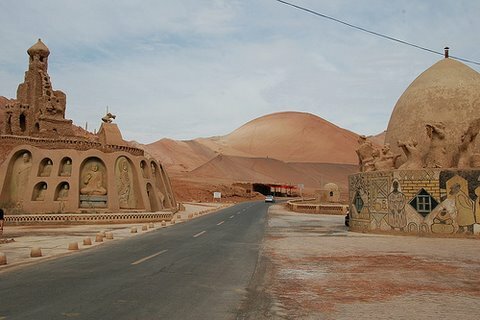 The Jiaohe Ruins are located 13 kilometers west of Turpan. The name ‘Jiaohe’ refers to the two rivers that join together in the southern part of the town. It was built with rammed earth and bricks 2,300 years ago. Spend some time wandering around the ruins. Be sure to bring plenty of sunscreen and water, as well as a hat, and brace yourself for the heat. Afterwards, meet and have lunch with a Uyghur family. Sitting in their courtyard in the shadow of grape vines you will learn about some if their customs and traditions. Help the family prepare the food and maybe even try your hand at making noodles or kebabs. The wonderful hospitality of the Uyghur people makes for a lovely afternoon. You will then return to Turpan for a free evening. You can escape the heat with a walk under a beautiful central avenue that’s covered with grape vines, where couples stroll, old men play games, and shops and cafes line the side streets.